It’s hard to believe that only four days ago Winnipeg looked like this, and now spring appears to be making its presence known a few weeks early. 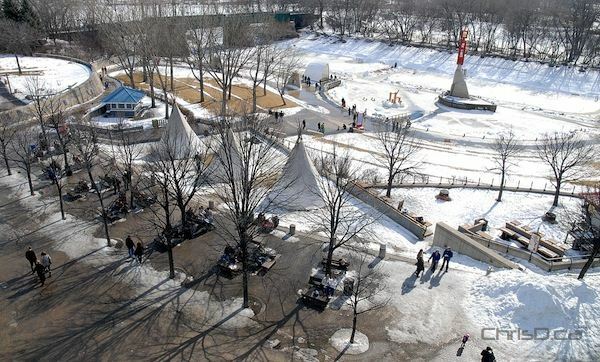 Winnipeg was treated to plus double-digit temperatures over the weekend under sunny skies, which is quickly making the 10 centimetres of snow that fell on March 2 a thing of the past. On Sunday, the temperature rose to 12.8°C — breaking an old daytime high record of 12.5°C set in 1981. The weather station at The Forks got up to 13.1°C. Records were also broken in Carberry, Carman, Fisher Branch, George Island, Gretna, Melita, Pilot Mound, Pinawa, Shoal Lake, Sprague and Wasagaming (Manitoba’s hot spot at 15.4°C). The warm weather made for perfect ice fishing conditions out at the Lac du Bonnet Ice Fishing Derby on Saturday. Fishermen were also getting in their last few days of enjoyment in Lockport, Manitoba before shacks are moved off the ice for the season. Around down, popular winter attractions like the Duck Pond skating rink at Assiniboine Park and the river trail at The Forks were being closed down for another year. Environment Canada is predicting the warm trend to continue all this week, with a forecast high on Thursday of 16°C. The official day of spring is March 20.